A photo of a Nigerian man proposing to is girlfriend has been making rounds on the internet. 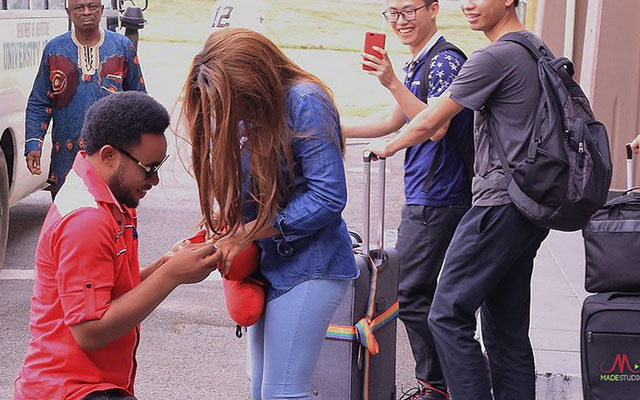 The special proposal is said to have happened in Akwa Ibom airport where the man got on one knee and popped the question to his girlfriend. According to the post made on social media, the girlfriend had just returned from a trip to the US and got the surprise of her life when she was welcomed by her man with a ring. The excited bride-to-be said yes and they are now counting down to their special day which date is yet to be announced. Congratulations to the couple.